Argentina "made progress" on Tuesday in talks with the International Monetary Fund aimed at securing an accelerated disbursement of a $50 million loan it hopes will calm its debilitating economic crisis. IMF Managing Director Christine Lagarde said she and Argentina's Finance Minister Nicolas Dujovne held "discussions about how the Fund can best support Argentina in the face of renewed financial volatility and a challenging economic environment." Lagarde said talks would continue on Wednesday, aiming to reach "a rapid conclusion to present a proposal to the IMF Executive Board." Dujovne said it was too early to "give figures when we're in the middle of discussions with authorities." Earlier, US President Donald Trump expressed "strong support" for Argentina, whose President Mauricio Macri has announced plans to slash the country's bureaucracy and raise taxes on exports to calm battered financial and currency markets and get the economy back on an even keel. "I have confidence in President Macri's leadership, and I strongly encourage and support his engagement with the International Monetary Fund to strengthen Argentina's monetary and fiscal policies to tackle the country's current economic challenges," Trump said in a statement after speaking with Macri. The peso has lost half its value against the dollar this year, hampering government efforts to get inflation under control. Argentina has already used a first $15 billion tranche of the three-year line of credit agreed in June, mainly to prop up its currency. Analysts warned that failure to reset the terms of the IMF loan would be costly. "Failure to secure further IMF funding or fiscal slippage before large debt repayments due in November would make default a very real possibility," said Capital Economics in a note. Andres Abadia of Buenos Aires consultancy Pantheon said Argentina's austerity measures "should be seen as a positive, but market confidence in Argentina remains fragile." "The meeting with the IMF will probably help to have a clearer picture of the country's prospects," Abadia added. The Washington talks come a day after Macri announced he is slashing the number of government ministries by half and restoring a tax on booming grain exports to bring deficits under control. The move signaled the abandonment of a gradualist approach to reducing inflation by the market-friendly president, who was elected in 2015. "We must move a lot faster," Marci said in a televised address. Macri, a center-right politician elected on a commitment to economic reform, appealed to rich exporters to do their bit. "We know that this is a bad tax, but I have to ask them to understand that it is an emergency and we need their contribution," he said. At the current exchange rate, the move would put an extra $7.1 billion in state coffers. 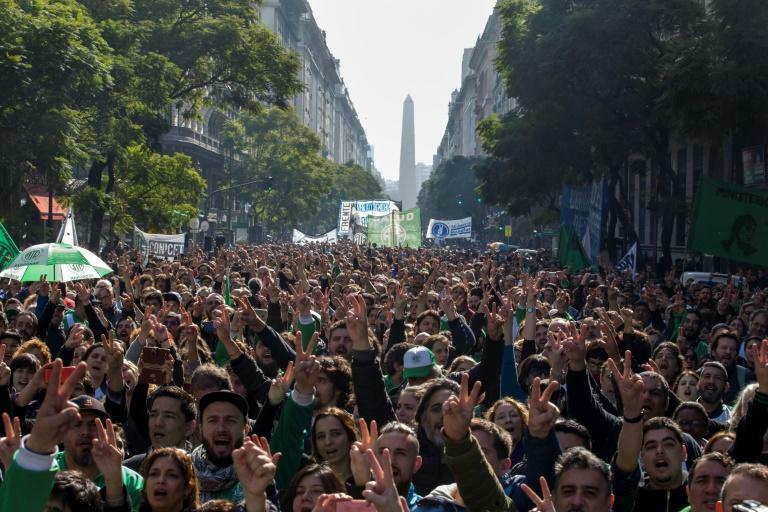 Argentina's 25 percent-plus inflation has left many struggling, and hundreds took to the streets in noisy protests around Buenos Aires late Monday. 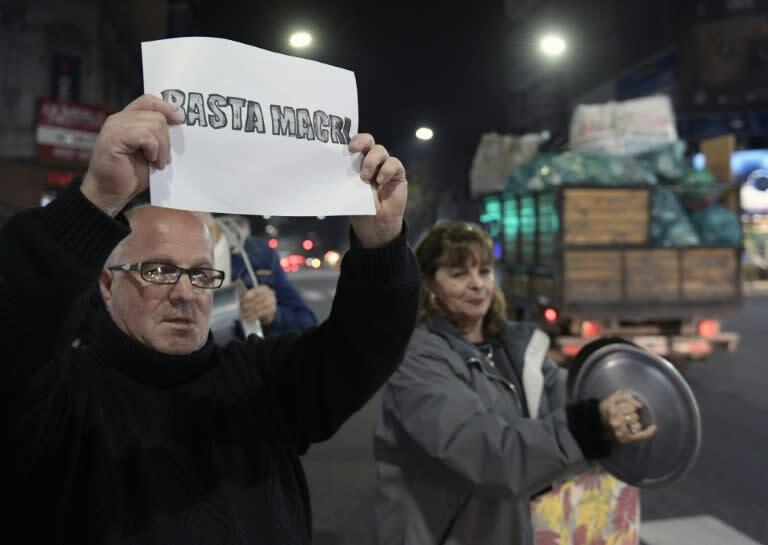 "We are utterly outraged," said retiree Maria Eugenisa, at one night-time demonstration in which around 100 people banged pots and held banners saying "No to the IMF." "It was an over-acted, rehearsed speech that doesn't take into account the disaster they have created because they impoverished us and they send the money abroad," she said. Another retiree, Liliana Mayoral, said she was fed up with austerity. "We had to go out (and protest) because if you don't, you'd die from an ulcer. Something must be said, something must be done and the noise, besides everything, is therapeutic, not just an expression," she said. Twelve of Argentina's 22 government ministries will be closed or merged under the measures, including two key portfolios, health and labor. Santiago Ponce, a labor ministry worker, said slashing the government was a bad sign. "Halving ministries implies a really dire situation for the public administration and the state. They are reducing the state, they are shrinking it, the state is losing its power to regulate." Argentina has already pledged to cut its budget deficit to 1.3 percent of GDP in 2019, but at a press conference prior to leaving for Washington on Monday, Dujovne said it would go further next year and eliminate its primary deficit -- its borrowing needs before debt servicing. "In 2019, we want to reach primary fiscal equilibrium, and by lowering the deficit, we will lower our need to issue debt," the minister said. The current deficit target for 2018 is 2.7 percent of GDP.